Access to marriage, he reasoned, is as much about equal dignity and public recognition as tangible rights or benefits. It’s a key point that ties together public accommodations and access to marriage: Neither is solely about enjoyment of material things; both are also about the dignity that comes with fully belonging to the broad public. 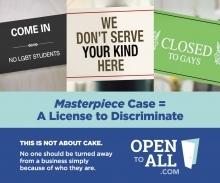 This means not only that individuals can’t be denied access to public accommodations (in commerce) and recognition (in marriage) but also that individuals who offer such accommodations and recognition can’t selectively exempt themselves from belonging to that public based on who seeks their service. If the Supreme Court were to find a constitutional right to discriminate, virtually any business could claim exemption from federal and state civil rights laws, shattering protections not just for lesbian, gay, bisexual and transgender people, but also racial minorities, women, the disabled and others. The role of a cohesive public in conferring that dignity is especially pronounced when it comes to marriage. By definition, marriage is a private union that’s sealed by public action. Any two people can pledge a commitment to each other, but it’s the recognition of their community and state that makes it a marriage. Granting individual exemptions erodes that public recognition. This is why the government’s approval was central to gay people’s quest for marriage equality — for reasons that went beyond simply financial and legal benefits. (Otherwise “civil unions” would have sufficed, offering the same rights without the word “marriage.”) Gay people sought legal marriage because full access to this fundamental American institution was integral to enjoying the equal dignity of first-class citizenship. Equal access to the public sphere means equal access to the full public. Nothing less guarantees full dignity. Yet Phillips seeks to opt out of the public in “public accommodations,” something not essential to expressing a religious belief or artistic impulse. Marriage, like commerce, requires a public, and the public is all of us.